AB2CSV | Mac App Storeのアプリ検索・ランキング BuzzMac! 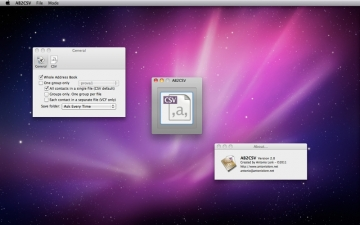 Also known as Address Book to CSV Exporter, this Mac OS X utility allows the user to export his own Address Book in one or more CSV or VCF files. Now available on Mac App Store in version 2.0, AB2CSV has been chosen by more than 70,000 users all over the world for five years. This simple and quick utility exports all your contacts with just one click. Mentioned by Macworld as "Excellent Add-On" in "Mighty messenger" article.